On the advice of my cousin Cynthia, I bought the book "the no-cry sleep solution". One suggestion was to make the crib a fun place to be, so this week we started play sessions in Alices' crib. One thing she loves in her crib is the Rainforest waterfall. It lights up, plays music and the little characters move. This can keep her entranced for up to 10 minutes. I'd like to take a moment and thank the lovely lady who gave Alice this super cool crib toy - Thanks Rami. We are still working on getting Alice to sleep in her crib. 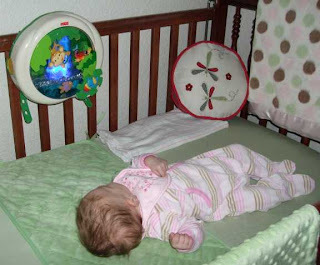 We are starting with naps - she is actually napping in her crib as I write this (YEAH), and hopefully we can move on towards getting her to sleep in her crib through the night. I'll keep you posted!